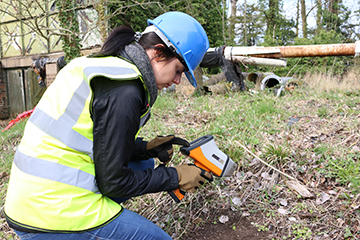 Concord, MA, May 18, 2017	(Newswire.com) - Oxford Instruments has added the X-MET8000 Expert Geo to its successful range of X-MET8000 handheld XRF (X-ray fluorescence) analyzers for geochemistry applications, including fast on-site environmental screening, mining exploration, planning and grade control. Easy to use and designed to withstand the harshest environments and weather conditions, the X-MET8000 Expert Geo offers results in seconds with real-time data sharing for fast decision making. X-MET8000 Expert Geo can measure up to 40 elements, with additional elements available on request. The X-MET8000’s speed allows high volumes of analyses and the fast completion of testing programs, saving time and money. The combination of the large area silicon-drift detector (SDD) and revolutionary super-fast detector electronics BOOSTTM technology provides up to 10 times the sensitivity of other handheld XRF models, delivering the low limits of detection required to measure critical elements accurately time after time. "The X-MET8000 Expert Geo will save users time and money in more ways than one: it's rugged and reliable so won't let you down in the field; its revolutionary BOOSTTM technology delivers faster analysis, even for trace elements, to help you complete testing programs faster and rely less on laboratory analyses; it truly is the tool of choice for soil testing and mining professionals." Data management is versatile: up to 100,000 results can be stored on the analyzer, downloaded to a USB memory stick or PC in a CSV format or tamper-proof PDF. Results can be printed on-site and attached to sample bags to avoid mix-ups. Alternatively, fully customized reports can be created using the report generator. Sharing results on-the-go with customers or colleagues is easy with the OiConnect app, while the OiConnect cloud service can export results securely in real-time and be accessed anytime, anywhere. Results from multiple X-METs can be managed with a single OiConnect account. X-MET8000 Expert Geo is available to order from 18th May 2017. Oxford Instruments Industrial Analysis is a leading global provider of high-technology X-Ray Fluorescence (XRF), OES Optical Emissions Spectroscopy, and Laser Induced Breakdown Spectroscopy (LIBS) instruments used for quality control. Oxford Instruments hires two national sales managers to further develop national accounts for its Optical Emissions Spectroscopy (OES) product line within the United States. These new hires have a wealth of experience in OES and are well positioned to strengthen OES across the U.S.
Oxford Instruments, a leader in high-technology analytical instrumentation used by engineers, quality managers and inspectors worldwide has made a significant investment in its North American support team (OI Service). This investment encompasses the training, tooling and extra personnel needed to bring OES support for U.S.-based customers in-house following dissolution of an exclusive partnership with its U.S. distributor and service provider.